There are few better times to be in India than during the Navratri Festival, one of the most important events in the Hindu calendar. Though several iterations of the festival are celebrated throughout the year, the most important edition of Navratri falls at the beginning of October (1st – 10th in 2016), and coincides with the harvest season. 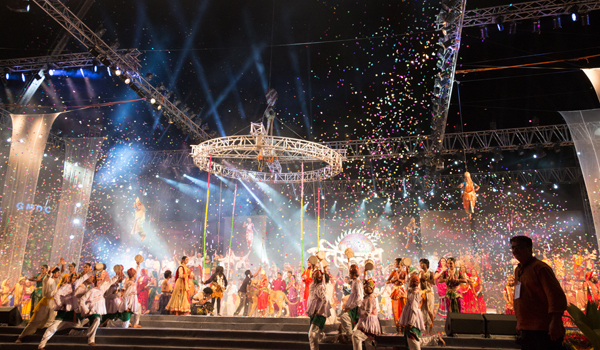 It’s a time of great colour, dance, and celebration – and visitors to Gujarat, where some of the liveliest festivities are held, are in for a spellbinding experience. Navratri, whose Sanskrit name translates to “nine nights,” celebrates the victory of good over evil. It’s also the time when three different forms of female divinity are honoured: Durga, Lakshmi, and Saraswathi, who are said, respectively, to destroy vices, bestow spiritual wealth, and foster wisdom. For those who are celebrating the festival, the spiritual devotion translates to dance – and lots of it. 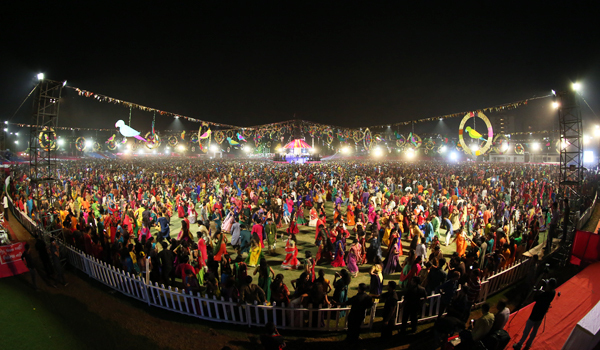 The Navratri Festival is said to be one of the world’s longest dance festivals, and for nine nights, revellers participate in a number of traditional dances. 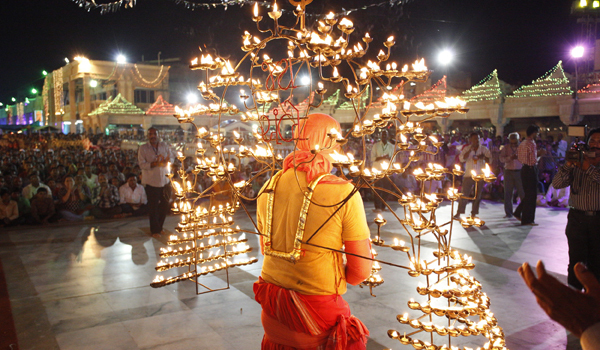 In Gujarat, one of the key dances is the Garba, which is performed to honour Durga and divine motherhood, and sees participants circle around a glowing lamp. 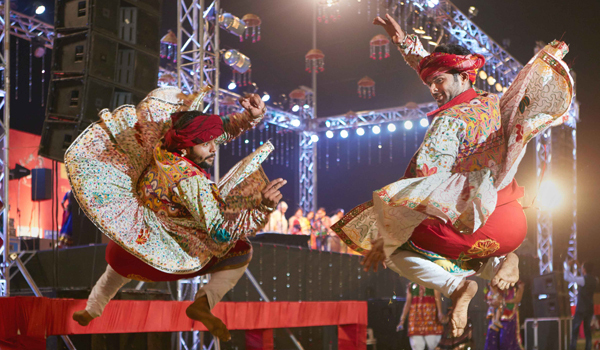 Typically, dancers wear brightly coloured, lavishly embroidered outfits, as well as heavy jewellery, resulting in a gorgeous devotional spectacle. 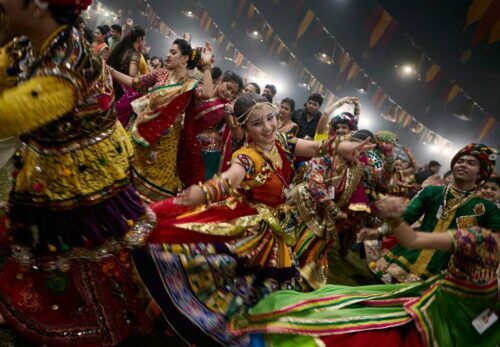 Another traditional Navratri dance is the Dandiya Raas, which follows the Garba performances. The high-energy dance consists of complicated choreography between male and female participants, who perform while holding and hitting dandiyas – small sticks that are meant to symbolise Durga’s swords. In recent years, these traditional dances have also been supplemented by evenings of acoustic music, contemporary dance, and other glittering performances. In addition to dance, the Navratri Festival inspires other forms of celebration and devotion: think feasts of generous proportions, an abundance of flickering earthenware lanterns lit to symbolise divine power, and beautifully elaborate costumes. Navratri is also thought to be an auspicious time to buy gold jewellery, so those who are after an excuse to indulge in some glittering tokens would do well to visit the gold markets that cater to seasonal shoppers. 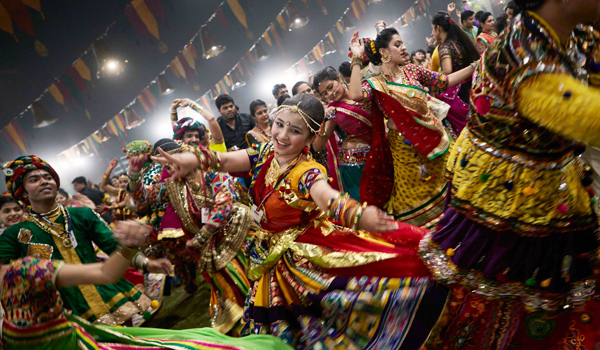 Looking to experience the colour and joy of the Navratri Festival for yourself? While even small villages across Gujarat will be hosting events of their own, for access to the widest range of events, it’s wise to plan a stay in Ahmedabad, the state’s largest city. Look for large-scale dance events that blend the modern and the traditional. In addition to the many performances and events held in Ahmedabad, visitors can learn more about traditional Gujarati culture during their time in the city. Heritage Walks are a popular way to explore, and travellers can also pay homage to Gandhi at the Sabarmati Ashram and discover local landmarks like the multi-hued Swaminarayan Temple. Other holy sights in the region – including the Ambaji Temple – also draw their share of devotees. But whatever’s on your agenda, don’t miss the chance to enjoy the Navratri Festival in all of its energy and splendour.